What was Mona Lisa thinking while DiVinci was painting her expression in oils? 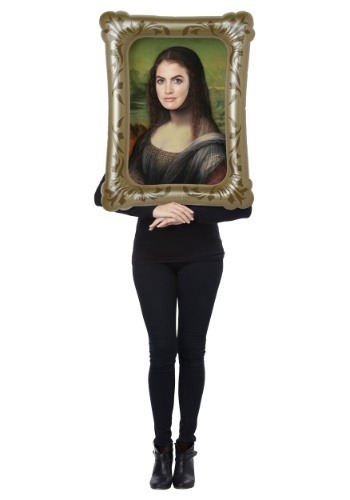 Was she wondering if her sister would be mad that Mona borrowed her best dress to get her portrait done? Perhaps she was plotting on her come back when her sister saw the finished product and finally realized why the gown had been missing every single Tuesday for a month. Or maybe her secret mirth was directed at the painter himself. Did DiVinci have a streak of brown paint in the middle of his face from when he itched his nose? Was there a servant in the doorway making faces as she waited to serve lunch? The thing is, we'll never know what she was thinking. Unless that is, she comes back to tell us! Solve the mystery and let everyone know what the mysterious Mona was thinking of by dressing up as her legendary portrait. The light-weight inflatable frame will make being framed more comfortable than ever while the portrait inside the frame leaves a hole to put your face through. This costume can be worn again and again. It's a great pick for art teachers who want to have a little fun with their class as well as folks who want to show up to their local Rennaisance Faire in style! Hey, you could even pair up with Leonardo. You're the masterpiece, you get to decide!